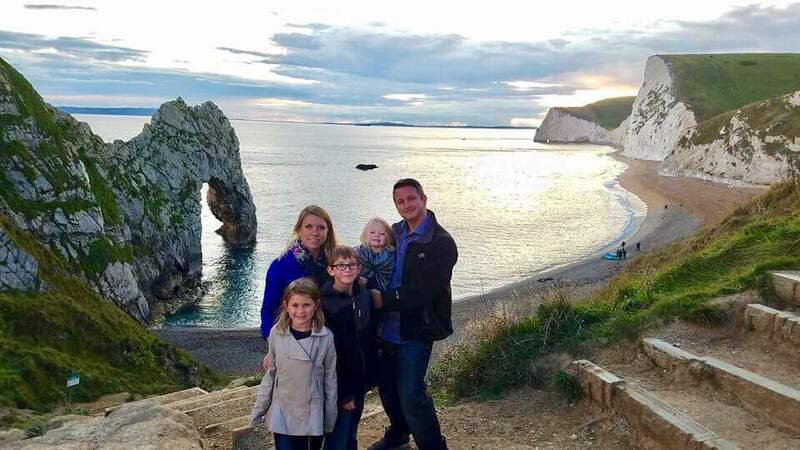 We decided to take a trip through Europe with our 3 small children ages 3, 7 and 10. We’ve always loved to travel and we’ve always taken our children along. We want them to appreciate different cultures; the history, language, food, religion, sights, everything! A smile is a smile in any language and we’re proud to say that’s something they’ve learning through travel. This European trip took us too Rome, Positano, Florence, Pisa, Venice, Murano, Burano, Paris, London, Bath and Dorset. We were super busy to say the least. Every city had a different vibe. The people changed as we traveled, as well as the food, climate and price tag. The kids took it all in, sometimes we bribed them with gelato but that’s just good parenting, right? Our favorite part of the trip was renting a car in London and driving to the coast. Our first stop was the Roman Baths, then we drove to Stonehenge and from there we drove to the Jurassic Coast to see Durdle Door and Lulworth Cove. Durdle Door was impressive and well worth the drive. Dorset was a neat English town, but everything was about closed by night fall. destination but I didn’t recognize to what degree until we traveled with our kids. We were offered a free private boat ride, a free meal, they escorted us to the front of a few lines, people would get up from their seats on buses to let the kids sit down or offer their lap as a seat. Italians are loud, funny and easy going, especially if you speak a little Italian. Our kids got many hugs, kisses and pats on the head from many random strangers, we all loved it. I’ve booked trips with Holiday Cruise and Travel in the past and they’ve always treated us well. This trip Celina booked our flights and rail tickets. She was informational and I asked a lot of questions, to the point where I would say “Its me again.” She was patient, informative, professional and funny. I felt good knowing if something went wrong I had Celina on speed dial, just in case. Traveling is amazing, I love every single thing about it. I haven’t been everywhere, but its on my list. Leopolds go to the Dominican Republic! Celina and I spent 10 nights in the Dominican Republic early 2017! We decided we wanted to get to know whole country so we decide to spend the first 5 days traveling north from Punta Cana to Samana and Las Terrenas. We spent about 6 hours on "guagua's" which are their public transportations. Basically it involved flagging down overcrowded pick-up trucks and buses (so much fun). We stayed in a few hotels and visited some up and coming beaches and cities. The second half of the trip we met some friends in Punta Cana and stayed at the new Sandals resort! The resort was very good for the price. The pools and facility were beautiful but the beach could use some work and the restaurants were a bit underwhelming. We were also able to tour some resorts that we haven't stayed in which was fun! We love traveling to Punta Cana for great resorts, great beaches, great people and great prices!